Canadian Health Care: Next Fiscal Bubble? It was a warm summer afternoon when I was T-boned by a pick up truck while riding my bike. My life flashed before my eye’s which strangely caused me to think humorously, “hey, your life really does flash before your eye’s when you think you’re going to die”. Luckily my assessment of my death was inaccurate. As I lie on the pavement in the middle of the road gathering my whits I see that my forearm is broken in half and bent at 90 degrees, but still intact. I wasn’t worried though. “They’ll fix me”, I thought. I didn’t contemplate, “how will I pay for this”, after all, health care is free. A report from the Fraser Institute (2) projects 8 out of 10 provinces will have 50% of their total revenues swallowed by health care costs by 2028. Quebec is already there as of 2009/10 with 52.5% of total available provincial revenues from all sources going towards health care. A Diabetes association of Canada report (3) suggests diabetes will cost the health care system $16.9 billion per year by 2020. Alberta Health Services released a report in January 2010 (4) that cited “obesity translates into an economic burden of $1.27 billion (2005$) within the province of Alberta”. The Diabetes Association report also says those at risk for type two diabetes can reduce their risk of developing the disease by between 58 and 71% depending on their age, by simply exercising and losing 5 to 7% of their body weight. National estimates (5) show that obesity costs us 4.3 billion a year (2005$). A large portion of our health care costs are caused by our own unhealthy habits. This is something we can control. Everyone getting healthier would not save the system, but could be part of the solution. Alberta eliminated health care insurance premiums in 2009, leaving Ontario, Quebec, and BC as the only provinces that charge for health care premiums that are scaled to ones income, with all such fee’s being forgiven in the case of financial hardship. The Canada Health Act (6) says fee’s collected by the provinces can be deducted from the fed’s health transfers to provinces; meaning provinces that charge health insurance premiums might have equal amounts deducted from health transfers. Our system, heralded by many as a model of applied morality and scorned by many as a bureaucracy heavy welfare state that monopolizes services that could be better supplied by the private sector, is seen by both sides as one of the most critical government services that has yet to achieve a standard of delivery that appeases all. Before publicly funded health care the cost of medical care was too much for many so they didn't seek care, or if they did many would go bankrupt or be burdened with heavy debt paying off medical bills. Various attempts at private and public health insurance plans were practiced but none could deliver full benefits as the plans were poorly executed or were simply fiscally impossible to maintain. In the 60’s the pro Medicare pundits argued the morality of a just society includes caring for all whether impoverished or wealthy. Cue sound of happy music. Those opposed argued that freeloaders overusing the system and layers of bureaucracy would combine to inflate costs of delivery and result in raised taxes and divert funds allocated to other programs to shore up health care. Cue sound of evil empire music. I think both these suppositions are true and that we pretend we can resolve the dilemma either by charging that governments commit demagoguery by leveraging humanitarian needs to justify costs, or by demonizing private enterprise by assuming business is evil. Volleying tired talking points back and fourth hasn’t resolved anything. Is this all our nations best elected intellect can muster? Health care isn't getting any cheaper, but is becoming more effective in terms of being able to diagnose and treat illness and injury. Research, high tech hospitals, and better educated medical professionals make this possible. The humanitarian need for caring for the sick and injured compels us to pour recourses into public health care but there is only so much pouring our economy can handle. Continuing to do things the same way won't solve the problem. The challenge of cutting costs while simultaneously raising standards is tough and so far we keep raising taxes and throwing money at the problem without planning for the future. If the forecasters are right, if obesity, our aging population, and our mismanagement of public and privately funded medical care have a predictably serious financial crunch arriving within the next 20 years, then we better do something about it. When we’re struck with an illness or injury, we need care, sometimes very expensive care, and we need it promptly. I don’t think anyone should be denied access to health care, even if they have no money or have brought harm to themselves. Maybe if we can get passed the rhetoric we can find a way to sustain health care through a mix of private and public modes, better management, and taking personal responsibility towards getting healthier. All we have to do now is elect people that can pull it off. Good luck. Umm.. can't I just eat and not worry about all this academic mumbo-jumbo? Of course! Err.. if you're emotionally calibrated and aware of how your emotions drive food decisions, otherwise you may blindly eat, and eat, and eat..
Obviously if we eat too much we'll gain fat. Clearly if we keep this up we put ourselves at significant risk of becoming unhealthy. Common sense right? So.. why is our population becoming more overweight every year? Where is the application of this common sense? Researchers are showing that despite the obvious negative effects of overeating most people feel compelled to overeat most of the time. We have to move beyond talking about the latest diet and exercise scheme and become more aware of our habits, our social norms (overeating is celebrated), environmental cues, and how our emotions and sense of reward, risk, and harm affect our healthy, or unhealthy decisions. Let's stop being eating automatons and start feeling good about mindful, healthy choices. Emotional Intelligence, which arguably can be interpreted in a few different ways, has generally been accepted as referring to the ability to be self aware of our own thoughts and feelings, as well as being astute and sensitive enough to correctly interpret the emotional state of others. A benefit of having a higher emotional intelligence is the ability to be more empathetic towards others when they're feeling down (or up), and having a greater ability to understand ones own feelings and make better decisions with this insight. A new study carried out at the University of Toronto and published in the journal Psychological Science (1), suggests emotional skills can be used for good or evil. "In one study, the researchers had participants fill out a survey on how strong their “moral identity” is—whether it’s central to their sense of self that they treat other people with kindness and compassion. Then they had people take part in a game that tests how their behavior benefits the group. (Each person chose how many points to take from a pool; the more points you take, the better your chance of winning a lottery, but if everyone takes the maximum points, there will be no lottery.) People who have a high moral identity were kinder to others in the group—even more so if they were good at emotional regulation. In another study, they did much the same, but for the dark side; they asked people how Machiavellian they are—for example, if they agree that “anyone who completely trusts anyone else is asking for trouble.” Then the participants answered questions about a number of behaviors, for example if they’d ever publicly embarrassed someone at work. People who were Machiavellian were more likely to have treated their coworkers badly—particularly if they were good at emotional regulation. “Emotional intelligence is not character,” Côté says. “It’s like any set of skills that we have—verbal, mathematical, analytical—these are skills that can be used to promote moral goals or selfish goals.” Some employers are training people in emotional intelligence with the hope that it will make employees beneficial to the group. But, these results suggest, better emotional intelligence can also help people treat each other badly if they are inclined to do so. The results also suggest that training employees on emotional intelligence or EI may be a good thing as long as it is combined with enforcing guidelines for ethical conduct in the workplace." That bully who knows how to push your buttons? You might begrudge their seemingly ignorant behaviour, but chances are they're actually pretty bright but choose to use their insight to make you feel like crap and therefore carry out their evil sith-like schemes. Yes, I am a sci-fi nerd. No apologies. (1) Press release: Dr. Jekyll and Mr. Hyde: The Two Sides of Emotional Intelligence - Association for Psychological Science (Authors, Stephane Cote, Katy DeCelles, Julie McCarthy, Ivona Hideg- University of Toronto, and Gerben van Kleef- University of Amsterdam). A sense of reward allows us to perceive whether or not we have succeeded. Great. So how do you feel rewarded and achieve success? Seems like the old chicken and egg conundrum. Set a long term goal that is interesting to you and is difficult to achieve, but not too difficult. Allow yourself to feel reward from making small steps towards the big goal. Once you get a taste of success it tends to snowball and motivates you continue succeeding. Make the primary goal and the steps along the way something you can measure. "I want to feel better", is legitimate, but is too subjective to quantify and compare progress. Make sure you celebrate your success in a healthy way. A common error is using junk food or overeating as a treat or reward for achieving our fitness or health goals. Doing this continues hold healthy choices as not rewarding, and unhealthy choices as the real reason you are exercising. It doesn't take long to start making shortcuts to the unhealthy reward and sabotage progress. Expect to have set backs and work on perceiving setbacks as part of the process. Look at setbacks as incentive re-establish your reward connection with your healthy goals. It can take more than 20 weeks to start feeling like your new habits are natural instead of forced. Bring in the calvary. It's true the main source of motivation has to be self inspired, but it helps to have the support of others. Let your friends and family know what you are doing, and tell them about your successes and when you trip up. They'll be there to celebrate with you and help you through the sticking points. No back up available? You can definitely succeed on your own. Become your own best advocate and keep setting the bar higher until you reach your goal, then maintain your success. If you're waiting for someone else to motivate you, there isn't a very good chance you're going to feel motivated any time soon. We'll each have something fitness or health related that motivates us, but might have some trouble making the transition from contemplating doing something that will reward us, to actually doing it. To overcome this create a moderate goal that isn't unrealistic; losing 20 pounds in a week, entering and IronMan next month, or too easy, "I vow to get off the couch today"! Goal: Lose 20 pounds and reduce blood pressure. Set realistic time frame: the most successful long term weight loss results occur when weight loss is between 1 and 4 pounds per month. Losing 20 pounds over 20 to 40 weeks is realistic. Losing 1 to 2 pounds every month or so will keep you motivated because this success is very achievable. It's true that safe weight loss can easily be 4 lbs per month, but it's also true that maintaining that rate of loss has a much higher chance of failure, and after not achieving the short term goal 3 or 4 times often results in feelings of defeat, and many give up. If reducing blood pressure through weight loss is your goal, talk to your doctor about it. You can work with your doctor to set up future check ups to monitor blood pressure and weight changes, and your doctor can help ensure you're doing it safely. Adding the doc also adds a person that you'll feel accountable to, which can help maintain motivation. The goals that are the most motivating are individualized and originate within you. Is there something about your health or fitness that you find yourself wanting for? Whatever that is, that's a good place to start. Goals like losing weight to look better at the beach can be used as short term motivation to get you started, but unless you attach a long term feeling of continued reward to that you'll most likely pack on the pounds again in the winter. Getting fit fast doesn't work, even for pro athletes. Recent research shows that 51% of hamstring injuries experienced by NFL players occur during a 7 week preseason training period. For triathletes, 68% of preseason injuries are from training too much. This is where realistic goal setting becomes very important. Hammering hard without preparation will leave you feeling sore and burnt out, and no, these are not signs you're doing it right. Too hard too soon does provide short term results, but over the long term injury is the most likely outcome. Taking it easy to start an and making steady gains over six months will make you more fit than starting off with a boot-camp style of training that pushes you too hard too soon. "But summer is only a couple months away, I don't have time." Probably the most common concern I hear regarding amping up exercise in anticipation of summer. The challenge is we'll often put ourselves in this position annually, and kick ourselves each spring for not keeping it up over the winter. Better to think of making a long term sustainable fitness level that is built over time rather than trying to squeeze it all into a few weeks or months. Start now and build gradually and you'll still be more fit for July and August. Continue with those gains by giving yourself ongoing challenges to improve and by next summer you'll be far more fit and feeling much better. Think of neuroplasticity as a fancy scientific term for, "it's all in your head". Our brain holds our sense of reward, risk, and harm, and yes, we use our brains to generate our own motivation or allow ourselves to feel a lack of motivation. Research has shown that we can change our habits from good to bad or bad to good and that whichever we do, that's what we get good at doing and that's where we tend to stay... if we do nothing about it. I used to crave cigarettes. Now the thought of a cigarette disgusts me, and this feeling is elevated when I see a cigarette, or worse, smell one. So what happened? I used to be addicted. The scent of cigarette smoke used to make me want to light up. Instead of my brain making automated reward associations with smoking, my brain now associates smoking with risk and harm. The same thing can happen with exercise and nutrition habits, but we have to give it time, and need to practice being self aware; that is, being able to comprehend and interpret how we feel and how we are responding to those thoughts. Some refer to this process as an expression of "emotional intelligence"
When I was quitting smoking I would often think, "Just one. One will be OK, I've done really well so far one won't hurt.. this will be the last one." That's the automated behaviour developed over time to support smoking. What did I do? I recognized that I should expect to have these thoughts, and these thoughts are driven by established habit, but that these thoughts are not really justification to light up. I had to tell myself there is no reward with smoking and that ultimately I will feel better if I don't give in. Ultimately this is how we maintain our motivation to change; we have to change not just our actions, but our thoughts and feelings that are attached to those actions. If we continue to see exercise as arduous and an ends to a means but not necessarily enjoyable or rewarding, it won't be long before we are replacing exercise with other actions that we feel are more rewarding. How about good old "will power"? Think of will power as a sort of temporary booster switch you can flick on to a get short term burst of motivation. It works, but it runs out of power quickly. If we try to rely on will power alone we'll literally burn out mentally. Ongoing motivation comes from an internal drive and natural reward association with our goals. We have to practice our new habits and teach our brains to automate reward associations with the new habits. Imagine not having to work at feeling motivated to exercise or eat healthy.. That's what happens when living healthy becomes a habit. The best thing? Everyone can succeed. Another study looking at beetroot juice (1) has been published in the American Journal of Applied Physiology. 6 Days of 500 ml/ day of beetroot juice increased time to exhaustion during severe-intensity running by 15% in study subjects. The results are attributed to the high nitrate levels in beetroot juice, which act on reducing the oxygen cost of running. Blood pressure was also reduced: Systolic BP decreased from 129 to 124 mmHg after the 6 days of beetroot juice. A different study published in Medicine and Science In Sports and Exercise (2) looked at the effect of 500 ml of beetroot juice consumed 2.5 hours before cycling time trials. I was more interested in this study because it tested beetroot juice in a more real world competitive challenge. When an earlier study (2009 (3)) came out suggesting increased anaerobic performance from 1 week of beetroot juice consumption I of course couldn't wait to try it. Once I trained my pallet to like the taste it was pretty good.. a little tart at first. A friend of mine who tried it said they thought it tasted great right away. My results? I couldn't tell. Nothing showed up in my training measurements, but I didn't do lab testing, or controlled time trials. I keep meticulous records of my lactate, heart rate, and power output though, and over the 4 or 5 times I tried a one week trial of 500 ml/ day of pure beetroot juice no notable increase in performance occurred beyond what I usually see. Subjectively I can say that I could not detect any extra feeling of short term power endurance. The cycling time trial performance study (2) showed a 2.8 to 2.7% increase in performance for 4 and 16.2 km time trials, pretty big change for doing nothing other than drinking 500 ml of beetroot juice 2.5 hours prior to competition. This study did not do the longer one week of daily beetroot juice consumption trial like the other two studies I cite here so who knows, maybe there would have been a larger increase in performance with the one week trial. Hamstring injuries are particularly debilitating and can easily take an athlete out for a whole season. A recent study published in the American Journal of Sports Medicine (1) looked at hamstring injuries in NFL players over a 10 year period. 51.3% of the hamstring injuries occurred during the 7 weeks of training preceding the season start. Pre-season training is notorious for hammering athletes hard during training camps and during athlete assessments. This strategy is opposite to the proven long term progression where intensity and total work loads are increased incrementally as an athlete demonstrated adaptation. I believe we're still trapped into believing the go hard or go home hyperbole. It's true that athlete's can't achieve maximum performance without maximally intensive training, but it's also true that the real potential of athletes is brought out over very long periods of conservative increases in training loads. We've all heard athletes boasting about how stiff and sore they are after hard workouts, and indeed some athletes feel a tremendous sense of accomplishment if they barf at a workout; proving that they truly worked as hard as possible. Not really.. barfing is a result of abdominal distress in this case. Vomiting is not measure of muscle performance, efficiency of movement, or good tactical skill. Want to prevent hamstring injuries? Assess the function of all the muscles from the hips down, fix any problems found, then gradually increase training loads over long periods. According to this study, avoiding entering pre-season training camps unprepared would be a good idea. On the coaching side, if we know athlete's are at a high risk of injury during pre-season training, careful thought as to how to proceed with pre-season training loads might help reduce injuries. The iPhone has some interesting techno do-dads that lets it measure everything from seismic activity, sound levels, g-force, your heart rate, and your position on the planet. Actually there are few smart phones that will do all these things. 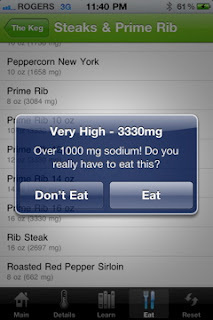 So what kind of super scanner thingy has been channeled by this latest app to reveal how much sodium is in the food you eat? Meh.. It's just a database. Oh, it does use the accelerometer to emulate a salt shaker so you discover how much shaking it takes to jack up your sodium intake (40mg of sodium per shake). While that's a whole bunch of fun and somewhat of a wrist workout, the real power of the app is in the list of over 2000 foods from "Canada's most popular takeout chains", according to the sodium101.ca website, launch site of the app. Besides, we get most of our sodium intake from what's already in processed foods and restaurant foods, not the salt shaker (77% from commercially prepared foods (2)). The icon on the iPhone app is a red circle with the words sick of it! in the centre. Hmm.. 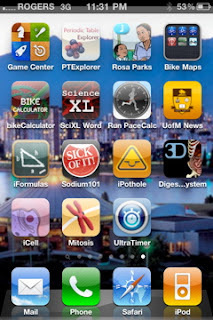 I guess you can see some of the other nerdy apps I have on my phone too.. The total sodium? 5362 mg. The amount is displayed in a thermometer like scale, complete with a glowing red boarder signalling you that you have achieved sodium purgatory. The thermometer graphic has a couple lines depicting 1500 mg, the amount of sodium the average adult needs in a day, and 2300 mg, the upper tolerable limit. 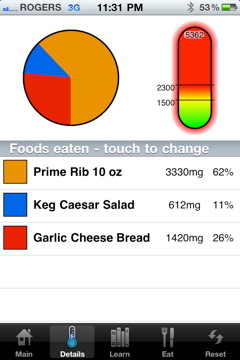 No, you don't barf if you go above 2300 mg, that's not what tolerable means here. More negative health effects are more likely when we consume more than 2300 mg of sodium per day. The average Canadian consumes about 3400 mg of sodium per day (1). When you choose a really high sodium food (over 1000 mg) you get an ascending whistle noise plus a pop up window asking; "Do you really want to eat this?" The sodium101.ca website says "the rate of stroke and heart disease could drop by 30% in Canada" if "most of us consumed no more than 1500 mg of sodium per day." Recent research published in the Journal of Nutrition (3) shows that high sodium intake alters carotid artery structure.. makes arteries more stiff. In 2009 Dr. David Kessler published the book The End Of Overeating, in which he describes his research that shows a combination of fat, salt, and sugar causes a "hyper-palatable" response where food tastes super rewarding, so much so it's beyond the brains normal capacity to properly process this heightened reward and so we have a big time desire to keep eating the high fat, high salt, high sugar food. Check out this article in the New York Times. Personally I really enjoy eating out, but after seeing how much sodium and total calories there are in so many restaurant meals I've almost completely stopped going to restaurants with the exception of a few health food places. Some restaurants are responding to the growing, but small, consumer demand for healthier meals. For me this change can't come fast enough. This was the first study (published in the Journal of Nutrition) of it's kind, until now we didn't know about the combined effects of fat and coffee on blood sugar. Hey what you don't know can't hurt you right? To test things out study subjects consumed fat, then coffee, then sugar. Researchers then looked at blood sugar levels. Compared to the baseline response from an oral glucose tolerance test, a test used to measure the bodies response to a fixed amount of sugar intake, consuming fat before consuming sugar made blood sugar increase 32% more than consuming sugar alone. When fat then coffee were consumed before sugar, blood sugar increased 64% more compared to sugar alone. So.. is it a good idea to put loads of cream and sugar in a coffee? How about a nice sausage breakfast with coffee? Study authors say those at risk of type two diabetes or those with diabetes might want to change their coffee consumption habits. "No problem, I'll simply wait a few hours between eating my fatty sausage and sipping my daily cup of coffee, can't go without my coffee.." Yes, I actually had quite a few people say just this when I told them about the study. In the study though, the fat and coffee were ingested hours apart (6 and 5 respectively), and an hour after the coffee they were fed the sugar. Though more research is needed to fully explain the result, the study also looked at hormonal responses at the same time and it appears fat and coffee some how blunt the bodies ability to tell itself to remove sugar from the blood; the pancreas may not be getting the message to release insulin. Any consumption of high fat or coffee (the study used two cups of coffee) can have severe and long lasting affects, according to quotes from the researchers in this Science Daily article. So, no, waiting a few hours between chewing the fat and downing the java won't help. Does this mean we should consider not eating high fat meals? Reducing coffee consumption? Thats crazy! Or maybe it's crazy not to consider it.. I'll give the quick summary to this story as I've covered the increase seen in repetitive strain injuries in other posts. A study done (1) at the Children's Hospital Boston showed that girls aged 9 to 15 who accumulated 8 hours or more per week of high impact sports and sports training, like, running, jumping, basketball, volleyball etc, had a twice the risk of stress fracture compared to those doing 4 hours or less of high impact activity. This may seem like another no-brainer, however if were that obvious there would not be the increase in repetitive strain injuries, like stress fracture, that are being seen in North America's youth who participate in sport. The researchers point out concern for young athletes who are being given exercise loads that are beyond the bodies ability to adapt. It isn't that high impact is bad on it's own, it's that too much of it is bad. Young athletes are often pushed into competing in and training for multiple sports simultaneously. The researchers say that it isn't unusual to see children training and competing for 20 hours per week. All those mirrors in gyms; proof that regular gym goers are narcissistic? Or could there be a more practical reason? Using a mirror to watch yourself during strength training helps with visual feedback so you can correct your form in real time, improving and maintaining good technique. Now researchers at the University of British Columbia (1) have used functional MRI to do much the same thing in getting people to observe their own brain patterns while learning to be more introspective. Why do we need this? Don't we know when we're being introspective? The results of the research are hoped to be put into practical use by helping people who may struggle with depression, anxiety, or trauma who may have negative thoughts they are not completely cognizant of. It's true; we can have automated emotional and thought responses to things and just accept these feelings and thoughts as normal and respond to them as such. For instance, the notion, "today is a really crappy day, just like every day", may be taken literally, but in reality to overcome the negativity associated with this negative thinking a person who improves their introspective skills would be able realize, "that's just a thought, and isn't necessarily true." In the study, subjects were able to see a computer screen image that showed brain activity in the part of the brain used for self reflective thoughts, the rostrolateral prefrontal cortex. The real time feedback allowed them to see whether their thoughts were the correct thoughts to achieve the goal of being self reflective, or if their thoughts were non-related to the task. The tasks were completed in a similar fashion to interval training commonly used in physical exercise. For this brain exercise the intervals were 30 seconds of raised or lowered mental introspection spread over four six minute sessions. Maple Syrup- Confirmed Super Food? Last year researchers from the University of Rhode Island published a study (1) showing 23 phenolic compounds discovered in Canadian maple syrup. News headlines touted pure maple syrup as the new super food to placed amongst other start foods such as blueberries and flax. The same group of researchers, funded by AAFC (Agriculture and Agri-Food Canada), have now found a total of 34 phenolic compounds believed to be of benefit to health. Some of these compounds are the first to be discovered in nature. One of the new compounds was named, "Quebecol", in honour of Canada's most prolific maple syrup producers. Quebecol is thought to be formed during the process of boiling down tree sap to a concentrated syrup. Although this study shows abundant antioxidants in maple syrup, many foods contain these compounds. It should also be noted that there are no studies showing direct health benefits from consuming maple syrup so while this is interesting news, there is no evidence that supports a positive health outcome from consuming maple syrup. 1 tablespoon of pure maple syrup contains 52 calories, about 10 calories less than a tablespoon of table sugar. Maple syrup tastes more sweet than refined sugar so you get more sweet for less calories. A tablespoon of maple syrup is about 20 grams and 52 calories. 28 grams of blueberries is 16 calories. Half a cup of blueberries is 42 calories. Researchers at Canada's McMaster University have been developing a vaccine to treat people who are allergic to cats. The vaccine is entering the final stages of clinical trials, and so far has been proven effective. When cats lick their fur, their saliva left on the fur (mmm.. cat saliva..) contains a protein that some people are allergic to. The protein is also secreted from sebaceous glands in the cats skin, which is sloughed off as dander. Researchers used this protein and it's structures to synthesize the new vaccine. No news on whether such a vaccine might be covered by health insurance or our medical system..
A lot of the loss of mobility and strength we experience as we age can be reversed or prevented with regular exercise. We will get slower as we age, but the rate we fall apart can be dramatically reduced by strength training and staying active. Our ability to respond to exercise is retained as we age. Both an 80 year old and a 20 year old will experience cellular adaptations to exercise, including increased strength and muscle size. Our total capacity reduces as we age, with the 80 year old producing roughly half the muscle force as the 20 year old. But the ability to affect change is is still there. This is an innate human ability and has more to do with our DNA than it does our will power or cultural habits. Exercise stimulates cells to remodel themselves. Exercise can cause bone, nerve, neuron, heart, lung, connective tissue and of course muscle remodeling. Ability to recover from exercise diminishes somewhat as we age, requiring longer rest periods between bouts of challenging exercise, but no matter what age we are, exercise stimulates DNA to give instructions to cells to adapt to the exercise. If you're human, and not dead yet, exercise can make you better at moving, and these gains can be very profound if you've lost mobility due to being less active as the years pile on. The main cause of slip and fall in the elderly is reduced strength and power in the muscles responsible for early recovery from slipping or going off balance; mainly muscles around the hip and lower extremities. Strengthen those muscles and you're less likely to fall down, and less likely to fracture if you do fall. You'll also go up and down stairs and get in and out of chairs better, or.. be able to enjoy the outdoors more. 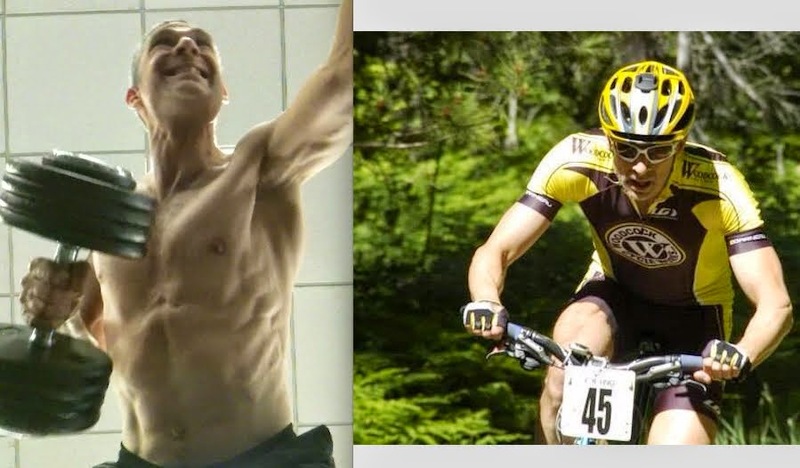 I'm middle aged and can already appreciate the difference staying athletic has provided me. I'm not as fit as I was in my 20's and 30's, but I'm fairing better than many of my equally aged early generation Xrs who found a less active path. I'm not saying seniors need to become athletes, but it is noteworthy that many seniors have decided to do so and we can see the bar can be set pretty high if the desire is there. Masters athletes in their 50's through 90+ are enjoying rejuvenated bodies with many developing greater levels of fitness than they had in their youth. Achieving a mere fraction of this potential can liberate many seniors from reduced mobility, and also prevent injury and illness. Not a cure-all for sure, but profound benefit that can substantially increase enjoyment of life, and maybe add a few years as well. Most seniors are not very active and their strength has dropped well below baseline, leaving a lot of room for improvement, despite an age related reduction in total fitness potential. Here's an example of a recreational marathon runner who started running marathons at age 48, and has continued to do so at age 91. From age 50 to 64 his finish times remained about the same at 4 hours. By his late 80's finish times levelled off at 10 hours. Br J Med Med Res. 2015;8(12):1074-1079.Aging, Fitness, and Marathon Times in a 91 Year-old Man Who Competed in 627 Marathons.Addison O1, Steinbrenner G1, Goldberg AP2, Katzel LI1. An important caveat is that some physiologists are concerned that overdoing strength training or endurance training as we age can create health problems, (study) so maybe obsessing over marathons or any exercise isn't the most fortuitous age-preservation strategy. Still, the point can be made that most people in their 50's through 90's can't run a marathon, or even run very functionally at all. With that in mind, being able to increase from nothing to a fair 10k is very achievable and could really turn around a lot of peoples lives. I'm not saying running is the focus here, I used that example just because there was an interesting study following a marathoner from age 48 to age 91. Find an activity you like and do it. Overall strength training has been shown to be the most important as we age, because it's overall muscle atrophy and loss of strength that reduces our mobility and basic function. Before that's read as leaving out aerobic, I personally intended on competing in mountain biking for as many decades as I am able. I'm 49. I also intend on keeping up visits to the gym for good old iron-pumping. A study from the University of Michigan has shown that seniors can build about 2.5 pounds of lean muscle mass over about 19 weeks of progressive strength training; strength increased by 25-30% over the same period. Dr. Mark Peterson, one of the study authors, identifies strength as one of the most important factors in maintaining function. Typically people become more sedentary as they age increasing the rate of loss of lean muscle mass and strength, and consequently less functional movement capacity. Instead of loss of function though, seniors can actually gain function, and gain lean muscle simply by strength training. The study authors are careful to explain that starting slow and easy with basic movements at home is important and that transitioning to gym with exercise equipment and adding more complex moves and heavier loads as one progresses is the key to muscle strength and size development. Resistance Exercise for the Aging Adult: Clinical Implications and Prescription Guidelines (PDF). The American Journal of Medicine (2011) 124, 194-198. Co-author: Paul M. Gordon, Ph.D., MPH., director of PAEIR. A study in Taiwan looked at over 1000 men and woman of about age 74. The study showed that those who exercised regularly were significantly less likely to suffer symptoms of depression. J Nurs Res. 2015 Nov 20. [Epub ahead of print]Regular Exercise and Depressive Symptoms in Community-Dwelling Elders in Northern Taiwan.Chang SH1, Chien NH, Chen MC. Another study suggests that perhaps up to 70% of those living in nursing homes suffer from sleep disorders, and that insomnia increases the risk of death in older adults. After 12 weeks of moderate aerobic exercise just 3 times per week (60 minutes) sleep quality and hours increased significantly in those aged 60-75 years. Curr Aging Sci. 2015;8(3):248-55.The Effect of Aerobic Exercise on Quantity and Quality of Sleep Among Elderly People Referring to Health Centers of Lar City, Southern of Iran; A Randomized Controlled Clinical Trial.Sharif F, Seddigh M, Jahanbin I1, Keshavarzi S.
Same story here. No matter what our age, exercise improves sleep quality, can reduce symptoms of depression, makes us stronger and more mobile, blah blah.